First Annual Contest of Liars! The time has come, once again, for the most fiendish of creatures to invade the Enclave - bringing with them a celebration of deception, lies, and for the first time, a little competition. This year, 3 factions are vying for your attention, each with their own agenda and rewards. The Contest of Liars will take place throughout the Masquerade of Liars event - October 23 to November 6! Step 1 - choose a team. Step 2 - gather some tasty treats from all over the sword coast. You are probably wondering what –or who- are the teams. This year’s teams are the Maize Masters, Toil and Trouble, and Knotty Roots. All three teams can be found in the central courtyard around the Tree of Balance in Protector’s Enclave. Maize Master is represented by Simon Straw, Toil and Trouble is represented by Witchy Wanda, and Knotty Roots represented by Thom Thorn. Follow the instructions given by the Contest Master until you have chosen a team and you will be on your way! Note: Team choice is account-wide. Once you've chosen a team on one character, that choice extends to all other characters on that account. Now that you have a team, the next step is pretty straightforward. Complete daily quests and add to your team’s stockpile of treats. When the contest ends, the team that has gathered the most treats wins the contest. Any members of that team, who have contributed the minimum amount, will qualify for a free gift and additional bonuses. The minimum required contribution can be tracked on the UI in the event tracker. This value is account wide so you can participate with any number of characters. The tallies for each team are hidden and the winner will not be revealed until the last day. The daily tasks available for each team ask you to gather a variety of different treats in 2 ways. First, you must visit all of our hub areas and seek out Spectral Tricksters. While wearing your team’s mask you must ask them for a trick or a treat and hope that they are in a treat giving mood, because the tricks can be rather ghoulish. The second task involves acquiring treats from the corpses of the enemies you defeat. This must also be done with the mask equipped. 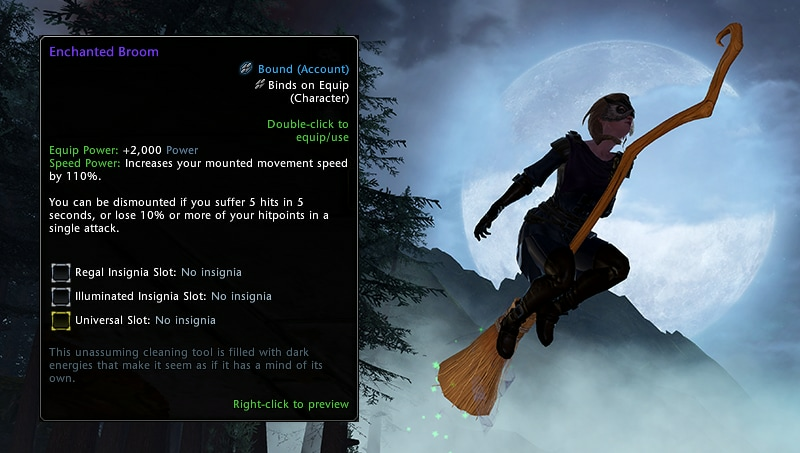 A word of warning: The mask uses the head slot so you must be extra careful when doing this kind of trick or treating. So after all this work, what nifty prizes will be available this year? And what’s this about only this year? Well, each year the winning team, and its rewards, from the previous year will be replaced with a different team and reward. So choose your team wisely and recruit as many friends as you can! Each team’s reward is a permanent illusion mask item that will grant you an illusion similar to the representative for that team. Winning team members who have contributed enough will get 1 free mask sent to them and will be able to purchase more at a discount on the event store. Anyone who was not a member of that team but contributed the minimum amount will be able to buy the winning team’s mask at full price. For example, if Knotty Roots were to win all minimum contributing members of that team would get a free “Visage of Roots” item in the mail. When they went to the event store they would see it listed as purchasable for a low AD cost. Member of the other teams would see “Visage of Roots” on the vendor for the full cost. 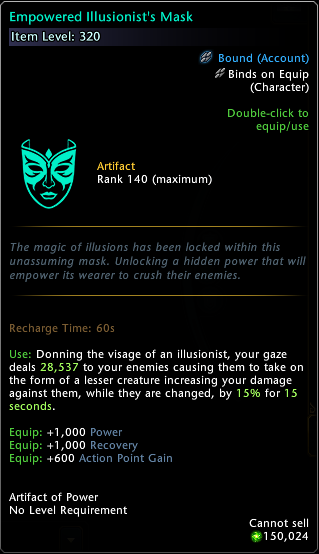 Empowered Illusionist's Mask - visit the Masquerade Event Blog for information on how to obtain this item! The broom mount was broken into 3 pieces and then scattered to the winds. 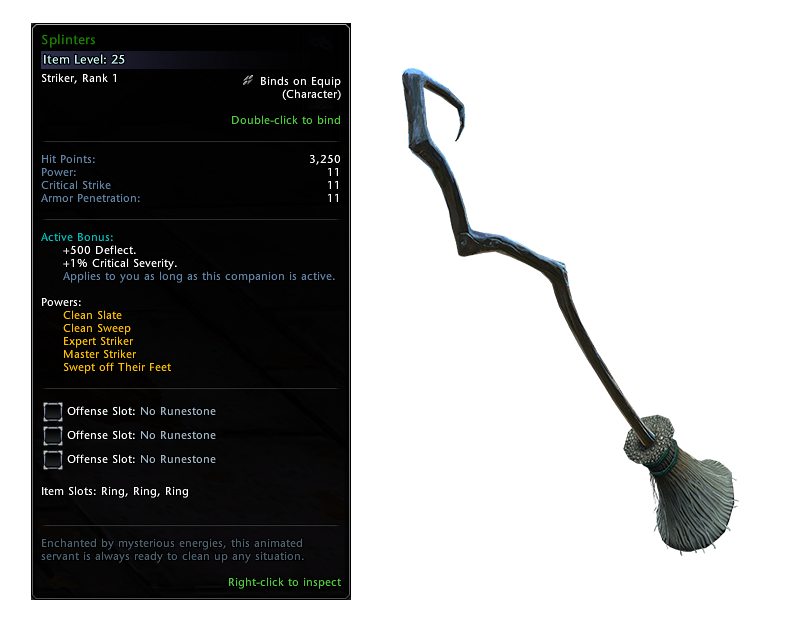 Over time these pieces have been found in various places and if you collect them you can rebuild the broom and add it to your library of mounts. That about covers it for the masquerade this year! I hope that you all enjoy the new stuff and that you have a terrifyingly wonderful time. 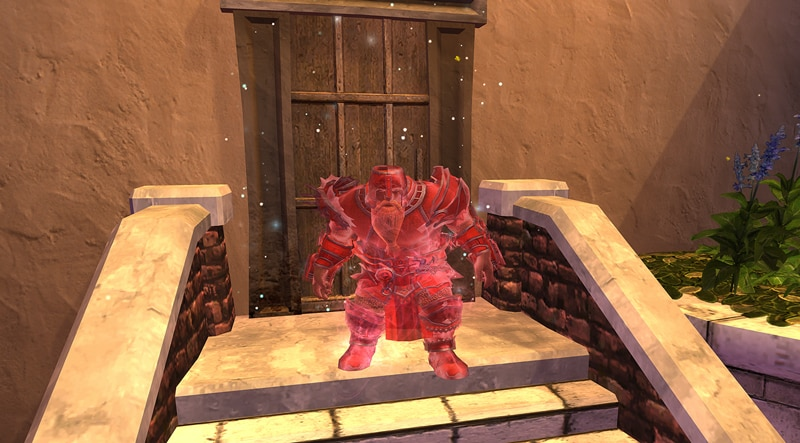 NOTE: Existing Masquerade events will also be active – you can read up on those here.